At 1523 on April 28, 1945, Lieutenant Junior Grade Hiroshi Nagao took off from Kokubu No. 2 Air Base as pilot in a Type 99 Carrier Dive Bomber (Allied code name of Val) carrying a 250-kg bomb and died in a special (suicide) attack off Okinawa at the age of 22. He was a member of the Kamikaze Special Attack Corps 3rd Kusanagi Squadron from Nagoya Naval Air Group. He was from Saga Prefecture, attended Seinan Gakuin University in Fukuoka City, and was a member of the 13th Class of the Navy's Flight Reserve Students (Hikō Yobi Gakusei). – I thank you for raising me for the long time of 22 years since I received life. – Please forgive my frequent lack of filial piety. – I was yours. I offered myself to His Majesty the Emperor, and I am not yours. After I entered the Navy, please be prepared for me to not be here. – I have a good Father, a good Mother, and two good Younger Sisters. I freely can face the decisive battle in the skies. – Father, acting for me, please bring up Yoshiko and Toshiko. – I earnestly pray for long life for you. – I pray for the health of you and my younger sisters. Father, precious Father, Mother, precious Mother, thank you for your care in many ways for a long time. I sincerely ask that you take care of Yoshiko and Toshiko. I will meet you in front of the main hall at Yasukuni Shrine . So then, I am going. Take care of yourselves. The letter comes from Hakuō Izokukai (1952, 203-4). 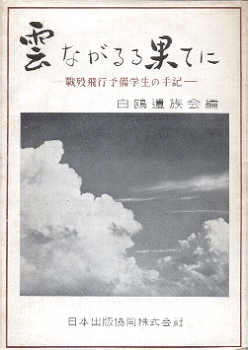 The biographical information in the first paragraph comes from Hakuō Izokukai (1952, 203 and Osuo (2005, 226).